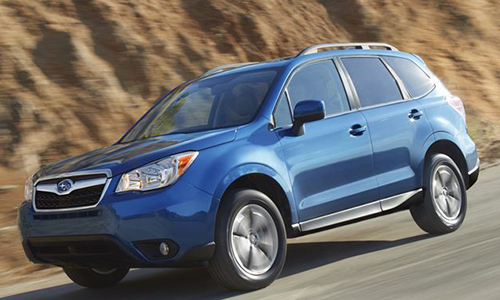 The all-wheel drive 2016 Subaru Forester has some exciting changes in store. When you test drive 2016 Subaru Forester you'll see that this popular SUV crossover has kept the car-like handling, off-road-ability and ample storage space that made it famous. And you'll love the added state-of-the-art digital technology, offering enhanced safety, entertainment and information services. The Forester has always been a top safety choice, and this year it remains at the top of the Insurance Institute for Highway Safety (IIHS) list. The interior controls are intuitive and sleek and the 2016 Subaru Forester also offers a quiet ride. And rear passengers love the increased legroom in the passenger section.The 2016 Forester comes in 6 choices, the 2.5i is the base with 2.51 Limited, Premium and Touring models available. The 2.0XT Premium and Touring models offer a bigger engine and more power. The starting price of the 2.5i is $22,395. The starting price for the 2.5i Premium is $25,295. The starting price for the 2.5i Limited is $28,795. The starting price for the 2.5i Touring is $30,795. The 2.0XT Premium starts at $29,195 and the 2.0XT Touring starts at $33,795. All models come with 15.9 gallon gas tanks. The 2.5i gets 22-MPG in the city and 29-MPG on the highway, with the Limited averaging 24-MPG in the city and 32-MPG on the highway. All models come standard with a multi-function remote, an onboard security system and cruise control.The 4 different 2.5i models are partial zero-emissions vehicles, meaning they have lower emissions than some hybrid cars. If you want to test drive 2016 Subaru Forester near Detroit, and see for yourself the beauty of this classic SUV crossover, schedule your 2016 Forester test drive at Glassman Subaru. The Glassman team will show you why they're the consistently considered the top Subaru Forester Dealer serving Detroit Troy Ferndale Southfield MI. As soon as drivers sit down behind the wheel to test drive 2016 Subaru Forester, they notice the center console's impressive technology. Subaru's Starlink system offers integration with Pandora, and a range of other information, entertainment and communication options. The driver's seat offers a 10-way adjustment system. Passengers enjoy the wide-opening back doors and the rear reclining seats. If hauling gear, those seats also have the option of flat-folding. And for drivers who like to let the sun in, or the moon in, a power moon roof is also available. Test drive 2016 Subaru Forester today at Glassman Subaru! Forester's stylish-but-rugged look gives drivers a sense that this is a multi-purpose SUV. All 2016 Foresters offer 17-inch aluminum alloy wheels, with the Turbo featuring 18-inch aluminum alloy wheels. With a massive 8.7-inch clearance space on the underside of the car, going off-road is a breeze, with few worries about damage from striking small obstacles. The standard, enlarged rear lift gate offers simplicity while loading or unloading cargo, and for extra storage the Forester includes cargo rails on the roof. The 2016 Forester offers 2 basic engine sizes, a 2.5-liter 4H engine offering 170 horsepower and a 2.0-liter turbocharged 4-cylindar engine offering 250 horsepower. The transmission system is highly rated for its fuel efficiency while still offering high performance. Subaru's X-MODE™ system is an available option, which monitors the all-wheel drive system and adjusts the engine power, braking system and the traction control in order to compensate when the car hits a slippery surface. This system is also helpful in maintaining traction on inclines and declines. Subaru's unique Boxer® engine utilize a system of side-to-side piston motion which helps the Forester give a smoother ride while still offering excellent power. To try it out, test drive 2016 Subaru Forester at Glassman, the top Subaru Forester Dealer serving Detroit Troy Ferndale Southfield MI. When you schedule your 2016 Forester test drive at Glassman Subaru, you'll notice the 2016 Forester features several high-tech upgrades. The high-intensity discharge (HID) headlights are an eco-friendly upgrade that creates a stronger beam using less power. An available feature allows for the rear lift gate to be opened, closed and lowered with controls on the key fob, the dashboard, or on the gate itself. The audio package is set to impress with available options like HD radio, Harmon Kardon speakers, USB inputs, iPod input jacks and access to SiriusXM™ satellite radio. The high-tech features continue with options for a voice activated navigation system, voice-controlled text messaging, and up-to-the-minute traffic information. Of particular interest if you're going to test drive 2016 Subaru Forester near Detroit will be the available all-weather package, offering heated seats, side mirrors and windshield deicers. All 2016 Subaru Foresters come standard with 7 airbags. The EyeSight® Driver Assist system utilizes 2 side-mounted cameras to track traffic conditions and alert the driver to potential collisions. This system is capable of applying the brakes automatically in the event of an impending collision, and it's also capable of adjusting cruise control speeds and alerting drivers when they're swerving. All 2016 Foresters also come with Antilock Brakes and Brake Assist, which can help apply the brakes faster in an emergency situation.Overall, the 2016 Forester succeeds in maintaining the classic ruggedness and versatility of what has become one of the most popular crossover SUVs. If you'd like to test drive 2016 Subaru Forester near Detroit, schedule your 2016 Forester test drive at Glassman Subaru, the favorite local Subaru Forester dealer serving Detroit Troy Ferndale Southfield MI. *The above information is regarding the base model 2016 Subaru Forester. Standard specs and features may change from year to year. Contact Glassman Subaru with any questions regarding the new or used vehicle you're inquiring about.